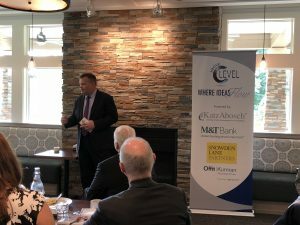 Maple Lawn, MD | June 25, 2018 On June 21st in Columbia, Maryland, retired Senior Army Special Forces Officer, John Fenzel, spoke to local business owners and leaders about his experiences while serving the United States. Offit Kurman partnered with KatzAbosch, M&T Bank, and Snowden Lane Partners to host this event. John has written three novels based on his experiences in the military. He has served on the personal staff of the Secretary of defense, as a Special Assistant to the Vice President, and as a White House Fellow during the Clinton and Bush administrations. With business leaders in attendance, John spoke about the importance of storytelling and emphasized the idea that everyone should tell their story. He shared detailed first-hand experiences of operations he commanded while discussing the value of friendship and the need for resilience in times of hardship. He also relayed his personal experience with writing and the therapeutic power it has had on his own life. John also addressed the topic of post-traumatic stress and his dedication to helping others. He led an open discussion about his new book, The Fifth Column, which tells the story of a retired Special Forces Colonel and CIA Operator, and noted that the characters are based on people he has known and events he has experienced.